On August 2, 2017, an American surgical team conducted a surgery to replace the sternum and partial ribcage of a 20-year-old woman using a custom 3D-printed composite titanium/porous polyethylene implant. 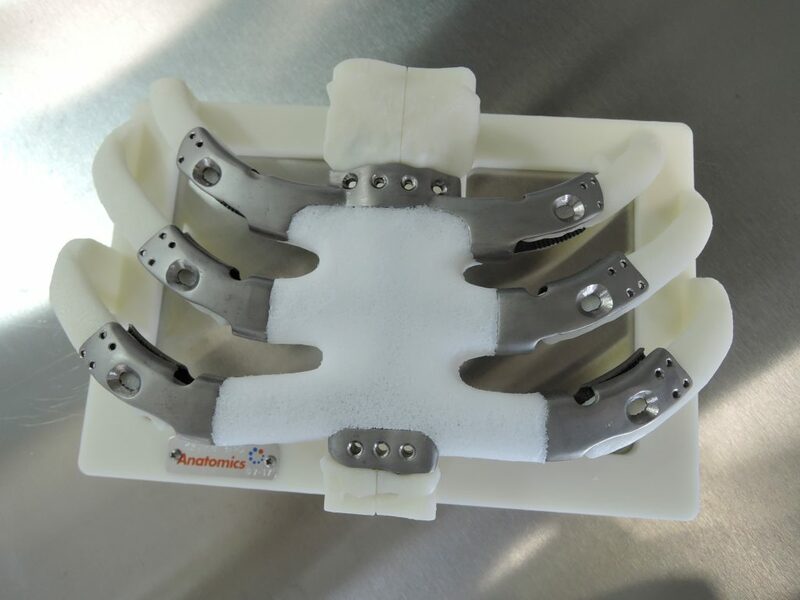 It is the first time this technology has been used in the United States and only the second time in the world that a 3D-printed composite sternum and ribcage has been implanted. The implant was designed and created for a patient named Penelope Heller by Anatomics and was made available to the patient via the United States Food & Drug Administration’s (FDA) Expanded Access (Compassionate Use) Program. Anatomics’ custom 3D printed implants do not have marketing approval in the US. The FDA’s Expanded Access Program provides a path to accessing devices for patients whom the treating physician believes may provide a benefit, but have not received FDA marketing approval. The custom implant was designed using high-resolution CT scans of the patient’s chest that were sent to Anatomics engineers via the secure AnatomicsRx software platform. After Dr. Port reviewed and confirmed the design on-line with the engineers, a biomodel of the patient’s sternum and ribcage was created and a build code was sent to Australia’s Commonwealth Scientific & Industrial Research Organisation’s (CSIRO) 3D printing laboratory, Lab 22. The patient’s custom sternum implant is the second in the world to also use Anatomics’ PoreStar technology, a proprietary porous polyethylene material with bone-like architecture. PoreStar is currently awaiting FDA marketing approval.